Nora Underhill needed a husband. Quickly. She had moved west to be free of her brother and sister-in-law and have a life of her own. Now, they were soon to arrive, and she knew the only way she could avoid once again being their unpaid servant was to find a husband. And she had the perfect man in mind. Simon Wallin was different than the rest of his family. He was always focused on making sure everything was correct, the right choices were made for their property, and he was somewhat reserved. The rest of his family were much more demonstrative, sometimes made choices that were incomprehensible, and there were times he just didn't understand them. And he knew they probably didn't understand him as well. As his brothers were finding wives and starting their own families, Simon didn't have a prospective bride in his sights. He was focused on their property and attempting to increase their holding. Which explained his shock when Nora approached him and proposed marriage. It was quite a logical proposal. Nora could gain independence from her family, and Simon would attain a tract of land they needed. She would continue to live in town, and he would remain at home. How could such a well suited plan go awry? 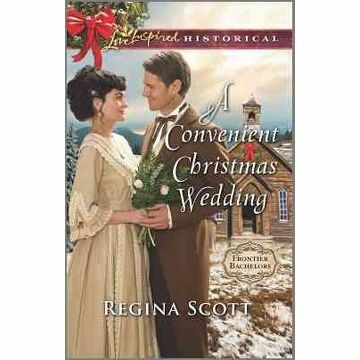 A Convenient Christmas Wedding was an entertaining romance from beginning to end. Simon is not your typical hero. He is quieter, focused on the land, and more likely to find fault with someone's actions than praise. After all, life in the frontier was dangerous. The Wallins had lost their father to a freak accident and there were dangers all around. Simon was always careful, cautious, and wanting to ensure everyone else was as well. Nora is a bit more spontaneous, helping everyone from family to a lame dairy cow. She thinks with her heart more than her head, to Simon's dismay. It was entertaining to see Simon thaw and Nora teach him quite simply how to enjoy life more. And also how to fall in love.